Cured Breakfast Hamburger - The BSB SportzMan - A Forum for OutdoorzMen! Through my work and personal life, I am in fairly regular contact with Howard, the father of a couple of girls that I went to high school with. His family, like mine, are descended from the "Germans from Russia" who farmed in Ukraine for a few generations; in fact, we recently discovered that, for a time, his family lived in the very same county and town in North Dakota that my own family did. 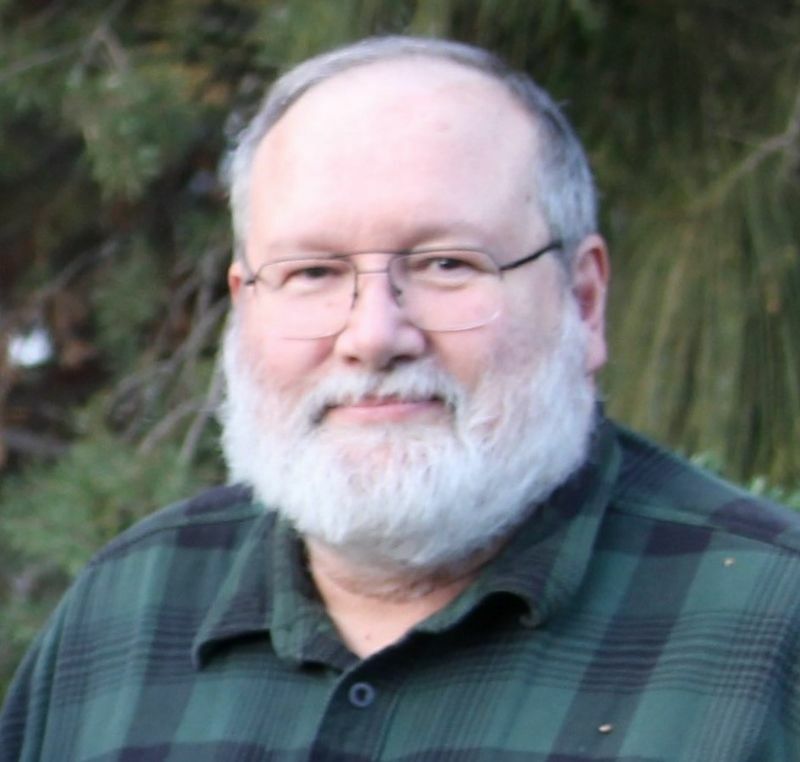 Over the past couple of years, Howard has been writing down and teaching various aspects of family tradition to his children and grandchildren, including gardening, canning and putting up meat for the winter. I am pretty impressed with how his children and their children are embracing these traditions, and it gives me some hope for the future; more than that, I am honoured and consider myself fortunate that he is also sharing many of these teachings with me. Last week, Howard dropped in with some dill pickles that he had canned and told me that he was on his way to the grocery to pick up some hamburger for a simple sausage that his own father used to make. He explained the over-all procedure and then said that he would drop by before long with a sample of the sausage and the recipe. Sure enough, this morning he came in with a pound of the sausage and an old, care-worn card with the recipe on it. With great enthusiasm, I thanked him for sharing this family tradition with me and promised to give it a try. I had some as part of my lunch and really enjoyed it; it's a good, old-fashioned, home-made product that has become something of a lost idea these days, where everything one could ever want to eat is as close as the nearest Pick-Your-Mart. Back in the day when this was devised (I'm guessing around the late 1930s or early 1940s, perhaps earlier with slightly-different seasoning), much of this sausage must have been made after the slaughter of a family cow, or perhaps after buying a large supply of hamburger from a ranching neighbor, or on a monthly trip to town for provisions; it was, surely, even made with venison from deer hunted in the fall. It is simple, good, rural country fare, probably fried alongside eggs as a quick breakfast before heading out into the fields, or put between a couple of slices of bread for a field lunch. It is what it is, and it comes from a time when simple issues were resolved with simple solutions. Purists might tremble at the recipe, with its liquid smoke; my reply to that is: well, don't use liquid smoke, then...smoke it! Some might also point out that it uses too much Tender Quick (curing salt) - at least according to package directions - and those people would, technically, be correct. My answer to that would be: well, use less, if you want, as long as it is enough. The fact is, in spite of these criticisms, this product, and many like it, were made on farms all across the country, before people had the benefit of mass communication and bouncing ideas off of each other on internet forums; as such, they had to figure out a lot of this for themselves. I have made similar products before, but not exactly like this. I am eager to try it and hope that I do justice to Howard's family tradition. I'll post a photo of the recipe card here, with written instructions below that; note that the written instructions include an extra step or two that are not referred to on the card. Mix the ingredients thoroughly together in a bowl; cover the bowl and let it sit overnight in the refrigerator for the cure to work. The next day, roll out the sausage into four logs, then wrap the logs tightly in aluminum foil. Poke holes in the foil, then put the logs into the oven at 325 degrees for 1 hour and 45 minutes. Be sure to put a tray below the logs to catch the drippings. 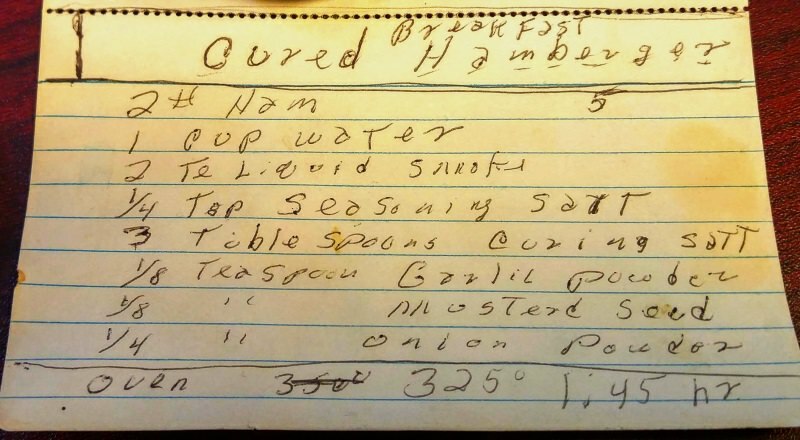 Are you sure first line of handwritten recipe, doesn't mean two 5lb chubs of hamburger? I'm seeing handwritten "5" on same line, does this "note" define size of pkg and recipe calls out for 2#, meaning two pkgs, not 2lbs? The rest of ingredients, match up for 10lbs of mild seasoned hamburger, four 2 1/2lb logs, seems more likely, than four 1/2lb sticks? I'll check with him, but I am pretty sure it is 2 pounds of burger. Will confirm. Hi, Robert - I got in touch with Howard and he confirmed that it is definitely for 2 pounds of burger, but we both agreed that the amount of TQ is too much, even though it is as his father wrote it down. The logs as he made them are half a pound each; about 6 inches long, with the diameter perhaps of a Coke bottle. This matches the one that he brought to me, as far as I can tell. Going "by the book," the amount of TQ for ground meat is 1.5 TEAspoons per pound, which would mean that for 2 pounds, the correct amount is 3 teaspoons, or 1 tablespoon. With those numbers, it's easy to see where one might make a mistake between teaspoons and tablespoons, and my guess is that this is what happened when the recipe was written down. Based on this, I will make a slight modification when I make mine. First, I'll cut the amount of TQ down to 1 tablespoon, which enough to do the job of curing the meat. Then, I will bring the amount of seasoned salt up, just a bit, probably to 3/4 teaspoon. This is more in line with what I have experienced in my own making of similar products: When I use the recommended TQ for ground meat, it actually lacks enough salt - to my taste - and I have to add about 1/4 teaspoon of salt per pound. I'll give this a try, and we'll see how it goes. I'm really tempted to double the mustard seed and garlic powder, as well, but we'll take a look at those after the TQ/seasoned salt experiment.